Load testing is a kind of testing which determines a system's performance under real-life load conditions. It helps to determine how the application behaves when multiple users access it simultaneously. BELLATRIX gives you such a library that can reuse your existing BELLATRIX web tests. Load testing is a kind of performance testing which determines a system's performance under real-life load conditions. Load testing is a kind of performance testing which determines a system’s performance under real-life load conditions. This testing helps to determine how the application behaves when multiple users access it simultaneously. This testing usually identifies the maximum operating capacity of an application. 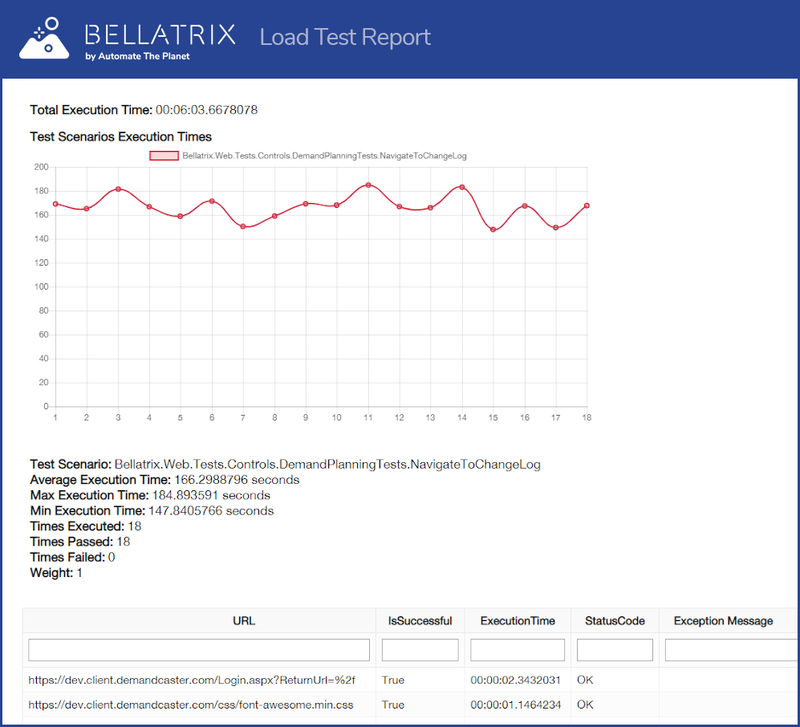 BELLATRIX offers a module for making load tests. The library offers various configurations such as the number of execution processes, total time of execution, regex filters for filtering some requests, specifying what type of assertions to be made and so on. You can change how the engine balances your test scenarios. It can execute them equal times or run some of them more often. A big problem of most load testing solutions is that your tests get outdated quite fast with each small update of your website. The usual fix is to rewrite all existing tests. To solve this problem, we integrated some of BELLATRIX most powerful features so that each time your web tests are executed, they will update your load tests as well. To mark a web test to be reused for load testing you only need to mark it with the LoadTest attribute and turn on the web requests recording. One of the newest features of all is that all of your web assertions will be recorded too and will be performed in your load test. The load test library will smartly decide which response contains the HTML of the page and based on the specified locators in your test will perform the assertion such as element is visible, some text is displayed or disabled. To use it you only need to set up the load test to make these kind of assertions. The load testing module also offers automatic check whether all of the requests were successful or not. After the load test is executed the tool generates an informative HTML report. Through the various grids, you can analyze what happened in the test. Locate the slowest web requests or the ones that have errors. Moreover, you can compare the different test scenarios.